This months inspiration is a piece by artist Jakub Rebelka. You can find more from Jakub on ArtStation or Tumblr. The challenge is this; write a short story (or other piece of fiction) inspired by the above image, it need only be a few paragraphs long. You have until the 28th of November to complete this months challenge. A hint of advice, I recommend really immersing yourself in the piece. Inspiration doesn’t always strike right away. Analyse the stimulus as a way of divining inspiration. 1st monthly writing challenge, April 2015.
this months piece of inspiration. this months piece of inspiring art comes from Pervander, who you can find on Deviantart here. The challenge is this; write a short story (or other piece of fiction) inspired by the above image, it need only be a few paragraphs long. You have until the 28th of April to complete this months challenge. You don’t have to send them back to us or anything (but if you’d like to here is our email: insertquesthere@gmail.com). We’ll post our own attempts on the 28th, Raymond has an idea, and Wilfred is considering taking a swing. We’ll be posting new challenges every month, so check back on the 1st of May to see the next challenge. I wrote a piece of short fiction based on the above image, and a conversation i had with a novelist friend on tumblr. i hope you enjoy it. Thank you to Kamron Brooks for help with editing. A cold wind whistled faintly across the dry desert plain. Blinking purple lights on perimeter probes were the only source of illumination. Thick green clouds hung low overhead, blocking the stars – a reminder of the scourge. Signs of life were absent from the surrounds, the desiccated skeleton of a solitary tree the only thing piercing the flat monotony of the horizon. Tall and broken, its silvery bark seemed to shine softly in the gloom. Beneath the tree, surrounded by metal spheres hovering on dragonfly wings, an infantry drone sat with a cyber-dog dozing in its lap. The drone’s optics clicked and whirred into life. One robotic paw of the cyber-dog twitched; the drone stroked its companion tenderly with a free hand as its other reached for its pulse rifle. The small cyber-dog rolled onto its feet and stretched out its legs ponderously. All tactical command Uplifts were based on Corgi genetic stock, their small size and natural intelligence a sound logistical choice. Easier to transport, less neuromechanical modification needed to Uplift. Externally, there was very little Corgi left. The cyber-dog was covered almost head to toe in plastic, metal, and composite, with a visor and sensor packs instead of soft doe-eyes and a wet black nose. “My legs are aching,” the cyber-dog growled. “We’ll need to source some replacements at the next Oasis.” You could tell from the sound of his augment voice box that more than just his legs were aching. 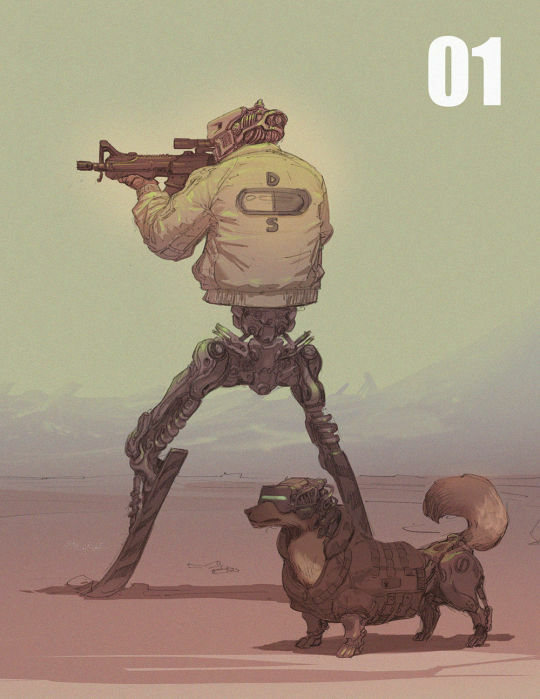 Cyber dogs had extended life spans, command units even more so. Still, 40 years was a long time to be online in hostile conditions. “How long till the storm is on us Ro?” The commander yawned into the name, stretching his muzzle wide, chromed teeth shining in the dim night. The humanoid combat machine opened a pouch on its superiors vest, pulling out a bar of food before replying. “If we remain beneath this tree and the winds don’t change, I would estimate 3 hours.” Ro stood up, the quiet sounds of the machines servos whispering across the desolate plain, and placed the food near its friend. They had been together since the closing days of the Australian-Indonesian war, more than 25 years ago. Ro picked a jacket up off the gravel, the only piece of clothing they had. It was stained, and the colour had faded, but it had few bullet holes. “Commander Kai. The probes have spotted a large dust trail coming from the north east.” It was hard for Ro’s voice box to emote concern, but it still managed it well enough. Commander Kai growled and snapped his head towards the dust trail. The visor grafted over his eyes shone with a diffuse red light as he sprinted up the dead tree, cyber-claws digging into the wood for purchase. The visor enhanced his vision while also overlaying the sensor data from the both the probes and Ro. He barked once into the night – it had the same emotion as someone cursing. “Lots of heat coming off their machine, whatever it is. My bet is humans from the convoy.” Kai let out a high pitched “Yip!” before jumping from the top of the tree and into Ro’s arms. The dry red dust kicked up behind them as their truck hurtled across the desert. A turbine engine powered by nuclear batteries salvaged from broken and defeated war drones pushed the machine forward at terrifying speeds. Built to provide light armour support to airborne infantry, the frame of the buggy was rugged and sturdy. Most of the original armour still remained but the main laser had been scrapped, a broken focusing lens rendering it useless. Missile pods had been stripped out to carry more people and supplies when needed. Tonight though, they needed speed. The radstorm was rolling in and the convoy needed shelter. Most of the large trucks and tanks could last a few hours, the scout cars and bikes sent wide to look for caves, bunkers — even a carport would help. The buggy was headed south west. 1 driver, 2 lookouts. Nadia was behind the wheel, Cassy in the turret, and Mich was in the navigator’s seat checking the screens. Of the three, only Nadia could remember life before the scourge…barely. A light pop sounded through the night, almost inaudible over the roar of the turbine. The pop was swiftly followed by bright flash of white light that faded to a yellow orb that hung in the sky. Nadia quickly swerved towards it. The flare had temporarily overwhelmed the IR scanners, but Mich managed to get something off the LIDAR; the silhouette of a tree with no leaves. “There’s a tree up ahead.” Mich paused as the sensors indicated a faint trace of a comms mesh near the trees. “Head over there,” he yelled up at Nadia, “and prime the turret.” The last part he directed at Cassy. They might not have had a laser, but a machine gun could still get the job done — most of the time. Nadia skidded the truck to a stop just a few metres short of the tree. Cassy slowly panned the machine gun turret to the left, stopping when it was pointed at the tree. As the turbine wound down the only sounds that remained were the random chirps and pings of the scanners, the heavy yet steady breathing of the scouts. Mich pretty quickly picked up where the bulk of comms mesh was situated, spotting a cluster of perimeter probes hung silently in the upper branches of the tree. An old model, they could hover at a maximum altitude of almost a thousand metres. Mich was at a loss trying to think of why someone would stick them in a tree. He quickly checked the IR sensor: it’d be working properly in a few seconds. “I’m gonna check out the bug bots” he called to his comrades. Locked into the side of his chair was his frag-gun. Looking like little more than overcharged blunderbuss, the frag-gun used a shaped charge to push a wall of fire and red hot shrapnel at whatever you wanted dead. It was best used at close range in a confined space though, which was why Mich also carried a machine pistol. Ro jumped from the dirt as the Scav-Hunter shouted, rolling forward and past. The turret swivelled to face where Ro had just been, but was now pointed at an empty hole. Ro slammed an overclocked arm into loud-mouth’s legs like a sledgehammer, sweeping him off his feet. The dirty man looked up at Ro, stunned. He was barely into his 20’s. “Sorry” Ro chirped as a robotic fist slammed in Mich’s face like freight train hitting a wall of butter. The machine gunner had found Ro. They managed to put 5 bullets into Ro’s back before the combat drone’s powerful legs launched it backwards a couple of metres. Ro tumbled to the left once it felt the ground beneath its legs, coming up into a crouched firing stance, and squeezed the pulse rifle’s trigger. A half-second’s burst worth of glowing red bullets punched right through what little armour the turret had, penetrating through to the dirty scavenger manning it. Two down, one to go. Once the shooting and the yelling had started, commander Kai had dashed out from behind the tree and headed for the car. Within seconds Ro had killed two of the Sanctuary’s scouts and Kai could smell the remaining woman panicking. She probably hadn’t ever encountered a fully refurbished infantry drone before, let alone one with over 25 years’ experience. The commander crept under the truck, a flechette gun sliding out from a combat slot on its back. Kai could see through Ro’s eyes and knew the drone was watching the last target. She was desperately trying to pick up her frag-gun, fumbling in her panic. The commander jacked Ro’s voice box. “Drop your weapon. Surrender your vehicle. If you comply, you will be allowed to live.” Kai’s words might have seemed strange coming from Ro, but it was something they’d done hundreds of times over the last quarter of a century. The woman trembled as she pointed the gun at Ro, who was too far away to be seriously injured by it. “Drop the weapon now.” Ro bellowed. The gun fired with a loud boom. Kai sprinted out from under the car, past Nadia’s legs. He leapt into the air, twisting around to unleash a tight stream of silent metal needles. At such close range the flechette gun shredded Nadia’s neck, face and shoulders. Kai slammed into the dirt, shock stressing his legs. A second later Nadia fell to her knees, blood bubbling out of a plethora of small pinhole punctures in her flesh. She tried to say something but just coughed a fine mist of blood into the air in front of her before collapsing into the dust. Ro slowly lowered the pulse rifle and walked towards the buggy. “Are we going to bury the bodies, commander?” Ro sounded almost genuine.